“Lumen Fidei” – a ‘faith’ or the Catholic Faith? “That which afflicts the Immaculate Heart of Mary and the Heart of Jesus….” (Sr. Lucia, C.D. ): “Rome will lose the Faith” (Our Lady of La Salette in 1849 – the whole Message approved by the Bishop in 1879). 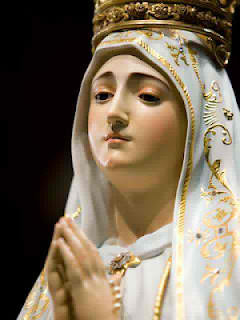 “[Not in Rome will]… the dogma of the Faith [be] always… preserved, etc.” (Our Lady of Fatima in 1917 introducing the Third Part of the Great Secret of Fatima – contained in the “etc.” – which Our Immaculate Mother desired to be revealed in its entirety as early as in 1960 “because,” explains Sr. Lucia, C.D., “it will seem clearer”: Vatican II – with its revolutionary Neo-Catholic orientation – was to be convoked in 1962). In the encyclical “Lumen Fidei” Pope Francis and his predecessor Pope Benedict XVI refer to the Second Vatican Council (1962-1965) as the “Council on faith.” If Rome were to lose the Faith in the 1960s – as hinted by Our Lady Herself – what was proclaimed since the Council was a pseudo-Faith, a “counterfeit-Religion, something that resembles [the Catholic Religion] but was not the real thing” – See “The Year 1929“. Good highlights which make the ‘faith’ of the encyclical “Lumen Fidei” appear to be Catholic: 1) Faith as divine knowledge – God is not a simple Object but the Subject Who makes Himself known (Ch. II). 2) EFFECT of the true Faith – makes us look not only to Jesus but also to see from Our Lord’s viewpoint, cf., our post “Christian Love: Love of the Cross“. “The Christian can see with the eyes of Jesus and share in His mind, His filial disposition…” (Ch. I). Points which make LF’s ‘faith’ anything but Catholic: 1) “Faith without truth does not save” (Ch. II). And the ‘truth’: “[that] which would comprehensively explain our life as individuals and in society” so that ‘faith’ “leads to [ecumenical] dialogue in all fields.” Therefore, Abp. Mueller, the manifestly MATERIAL heretic head of the ‘Congregation for the Doctrine of the Faith’, states, in introducing the encyclical at a press conference: LF points out the fact that faith “is an encounter” – as ‘Modernists’ would assert: a living experience of the existentialist/phenomenological tradition. Our Sacred Tradition teaches us that our divine Faith proposes to us the last end or the ultimate goal of our life (“as individuals and in society”) which we cannot know and attain by our natural powers but only by supernatural enlightenment (that is, by believing what God has revealed to us): our possession of God in Heaven. LF does not speak of THE saving Faith as that body of Divine Truths which Christ taught and delivered to His Church alone [this absolute Catholic position as the sole vehicle is offensive to Vatican II’s ecumenical dialogue] – hence, the Church, the pillar and ground of the truth (1 Tim. 3.15). No, what God has revealed can never be subject to a ‘dialogue’ (cf., our posts “The Great Tribulation” and “Our Lady and the Disorientation of Rome” on Vatican II ‘ecumenism’); rather, it demands the assent and adherence of reason though “not [comprehending] the extent, the breadth, and depth of how it is so” – this, reason does by the grace of God hence the saving Faith, a supernatural illumination, is truly a gift of God. This entry was posted in Christian Life, Doctrinal Instructions, Traditional Roman Catholic Order and tagged Ecumenism, faith, grace, Lumen Fidei, Our Lady of Fatima, Our Lady of La Salette, Pope Benedict XVI, Pope Francis, Sr. Lucia, the Holy See, Vatican II. Bookmark the permalink.